ready to enhance their corporate leadership skills, deepen their knowledge and revolutionize the customer experience. an innovative educational approach that combines management training with CX and UX optimization. corporate leaders who can manage teams effectively and create cutting-edge solutions for customers and buyers. In today’s digital world, it’s no longer an option to rely on traditional business models. User-centered design is the way of the future—and, for that matter, the present. This Dual Degree will prepare you to face these new realities, by encouraging you to think critically about the customer journey and develop products and services that optimize user experiences through innovative design. What’s more, you’ll complement these skills with the managerial and organizational training of IE’s world-renowned International MBA. At IE we believe that the leaders of tomorrow must possess not only a deep understanding of effective leadership strategies, but also specialized knowledge in emerging fields. This degree program provides the best of both worlds; first it lays a solid foundation in business fundamentals through the IMBA, which it then builds upon with the specific skills needed to drive innovation in the design of products, services and brands. 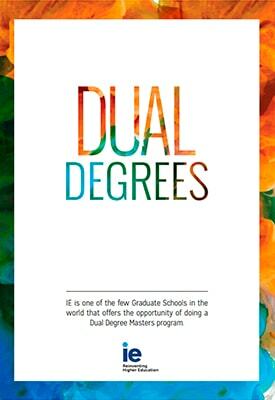 When it comes to efficiency and rigor, IE’s Dual Degrees are among the best postgraduate programs in the world. In less than two years, you’ll gain valuable real-world experience and technical expertise that will elevate your career to the next level. You’ll learn how to transform the customer experience, think outside the box and apply what you’re learning in real-world situations. Design your own educational path and take the next step toward your professional goals, with all of IE’s resources behind you. The faculty is amazing. Almost all of our professors are currently working in (or own/manage) great companies. They are super cool, have up-to-date knowledge and sometimes even bring us to their studios where they work their magic. Just meeting such people is impactful and fun!